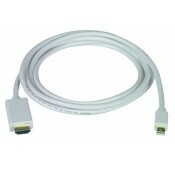 Male Mini DisplayPort to male HDMI-A cable. Supports standard, enhanced or high-definition digital video, and multi-channel digital audio on a single cable. Ideal for connecting a Mac (MacBook/MacBook Air/MacBook Pro/iMac/Mac mini/Mac Pro/Xserve), Toshiba laptop (Satellite Pro S500, Tecra M11/A11/S11), or HP notebook (Envy 14/17) to an HDMI display.